SANTA MONICA -- Walk into an independently owned 7-Eleven store in and around this sunny beach town and you'll find that the price of a dozen large white eggs ranges from $1.59 to $1.99. But at local outlets of Southern California's three major supermarket chains -- Lucky, Ralphs and Vons--the price is markedly higher: a uniform $2.09. A similar discrepancy prevails throughout much of Southern California, with independent grocers and convenience stores charging less for eggs than the big chains that dominate the market. Why the difference? The chains say the answer is simple: Given the basic law of supply and demand, they can command these higher prices. It is, they maintain, the free market at work. But according to the plaintiffs in a class-action lawsuit in San Diego Superior Court, the reason is much more sinister: In their view, there's an illegal price-fixing agreement among the major supermarkets. Over the past five years, they contend, consumers have paid $250 million more for eggs than they would have in a truly competitive market. The case, originally filed in 1996 with little fanfare, was recently set for trial; jury selection is scheduled to begin Nov. 2. The plaintiffs say they will not only prove that egg prices in Southern California are higher than those in other parts of the country, but that Lucky, Ralphs and Vons share pricing information through trade associations and other intermediaries and have at least a tacit agreement to keep prices high. "There is a mechanism...where the majors turn in their egg prices. It's 'You show me yours and I'll show you mine,'" contends plaintiffs' attorney Don Howarth of Los Angeles. "If everyone stays with the program, there's a benefit to all the participants. If not...the prices will spiral down." Perfectly orchestrated, Mr. Howarth says, the "conspiracy" manages to prop prices at the highest level, while keeping "the purchasing public sullen but not mutinous." The plaintiffs are seeking an injunction that would prevent the price of eggs from being fixed and unspecified monetary damages. Suit Alleges Grocers Fixed Egg Prices. 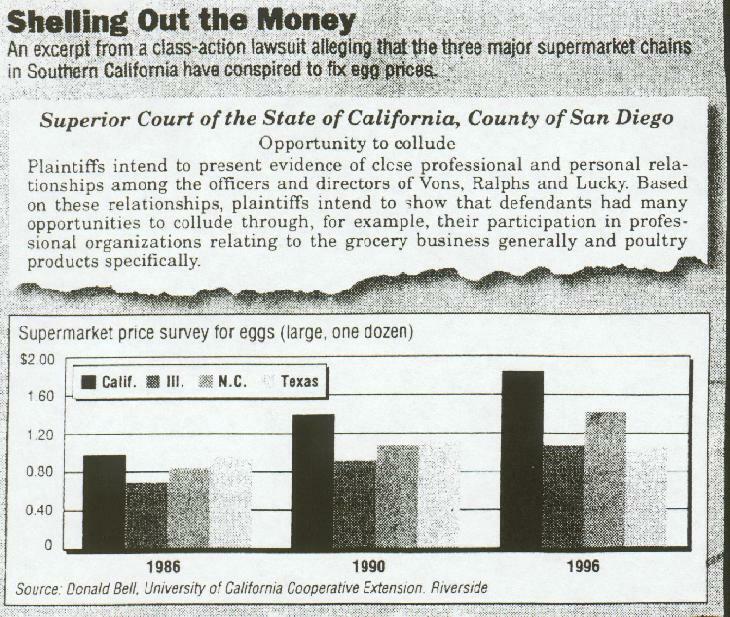 The supermarkets flatly deny the charge, and in court papers have challenged everything from the suit's factual premise to the qualifications of the named plaintiffs -- a sister and a friend of the young attorney who first filed the case--to represent the class of all egg consumers in Imperial, Los Angeles, Orange, Riverside, San Bernardino and San Diego Counties. Vons Co. "has never entered into any agreement with any competitor to fix the price of any product it sells, including eggs," the Los Angeles-based supermarket chain said in a statement released by its attorney. Gregory Stone of Munger, Tolles & Olson, "Vons' frequent promotions and discounting of eggs results in an average sales price that is well below the egg prices of Vons' major Southern California competitors." Even with all the wrangling, two things seem beyond dispute. First, despite controversies over their health implications, eggs remain a popular food. Consumption is down from its peak in the 1940s-- when the average American ate 400 eggs a year-- but Californians still consume about 240 eggs annually, some 30% of them as recipe ingredients. Second, although California is the nation's largest egg producer, with roughly one laying hen for each of the state's 33 million residents, its supermarket egg prices are generally the highest in the U.S. This has been so since 1983, when an epidemic of avian influenza wiped out much of the nation's chicken population and "prices went through the roof," says Donald Bell, a poultry specialist at the University of California-Riverside. But after the industry recovered, "the rest of the country took their retail prices back down--and California did not." According to Mr. Bell, the wholesale price of a dozen large eggs in California is now around 64 cents--meaning the supermarkets are marking up their eggs by about $1.45 per carton. Still, he says, "it's going to be very difficult to prove a willful agreement between those parties to do whatever they're doing. You can always look at any price in a store and say, 'Boy that's high.' But that's part of capitalism." Howard Shelanski, a law professor and antitrust expert at the University of California-Berkeley, agrees. "High margins can be the result of ...rational behavior" on the part of each supermarket acting independently, rather than through collusion, Prof. Shelanski says. Antitrust law, he adds, "has always wrestled with the problem of how to handle "high prices in a sector in which there is just a handful of particularly large players--an oligopoly. "Generally, the position has been to watch those industries carefully," the professor explains, "but you don't punish the firms" simply for charging as much as they can. The assault on supermarket egg prices was initiated by a San Diego attorney named Cash J. Bonas. Mr. Bonas specializes in antitrust matters; as he puts it, "Price-fixing is what I do." Shortly after his 1995 graduation from the University of Idaho law school, Mr. Bonas began comparing egg prices with his sister, Carrie O'Husky, an Oceanside schoolteacher. "It really kind of hit us that there was definitely something wrong, economically speaking." Mr. Bonas persuaded his sister and a college friend, Sheri McCampbell of Hermosa Beach, to serve as the named plaintiffs in the class-action suit against Lucky, Ralphs and Vons. Three other firms signed on as plaintiff's attorneys, including L.A.'s Howarth & Smith, which has participated in high-profile litigation against tobacco companies and an antitrust claim against the National Football League. In an effort to show that the named plaintiffs hadn't suffered sufficient injury, Vons went so far as to note that both "are Vons Club members and use their cards regularly" and that "Carrie O'Husky received a free turkey this past Thanksgiving" thanks to a store promotion. Despite the joking, consumer advocates say the litigation underscores a serious matter. "The major supermarket chains are gouging consumers on the basic necessities of life," charges Harry Snyder, senior advocate at Consumers Union's West Coast regional office in San Francisco, which has released studies showing that supermarket milk prices in Los Angeles and San Francisco are far higher than those of independent grocers. "They have some sort of agreement, either tacit or explicit, to maintain higher-than-competitive pricing," Mr. Snyder says, because "traditionally it's thought that consumption" won't fall on basic commodities like milk and eggs, even if prices rise. Trying to prove such an "agreement" exists, however, is bound to be an extremely complex matter. Mr. Howarth claims that the majors share information by reporting their prices to intermediaries, such as the Chicago based market-data firm Information Resources Inc., which then tell the supermarkets what the others are charging. But Information Resources denies that. While it does report "average" prices in the region, "we would not tell Ralphs what's going on with Lucky or Vons," says Bob Bregenzer, a senior vice president at Information Resources. Other claims by the plaintiffs as to how the alleged cartel operates are vague. For instance, the plaintiffs say in court papers that they will "present evidence of close professional and personal relationships among the officers and directors of Vons, Ralphs and Lucky" and of those executives "many opportunities to collude through, for example, their participation in professional organizations." Citing confidentiality orders imposed by the court, plaintiff attorneys wouldn't elaborate. What's more, it remains unclear whether there really is price uniformity among the chain supermarkets. It's true that in the Santa Monica area, the majors last weekend where charging $2.09 for a dozen large white eggs, while prices were lower at the local 7-Elevens, the discount gourmet grocery Trader Joe's ($1.19) and the upscale natural foods market Wild Oats ($1.69). But at the same time, Vons supermarket in Riverside were charging only $1.49--exactly the same price as Vons outlets in Las Vegas, a city that the plaintiffs cite for its low egg prices and assert is not part of the alleged Southern California egg cartel. Meanwhile, at an El Cerrito Lucky--in the Bay Area's Contra Costa County, outside the region covered by the suit--the price was, again, $2.09. Mr. Bonas insists that despite these pricing anomalies, he will prove his egg conspiracy at trial. And win or lose, one thing is certain, "I used to like omelets with bacon and onions," Mr. Bonas says, "But now I never want to see another egg again."